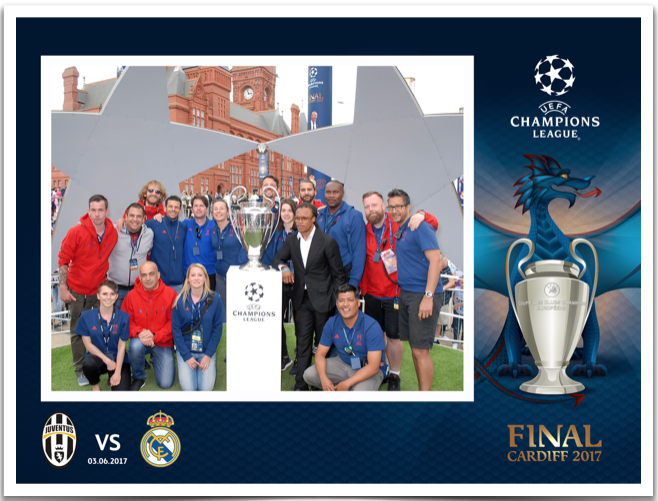 It was with great pleasure that Image Insight had the opportunity to once again work with UEFA, this time in the sunny Welsh capital of Cardiff, during the UEFA Champions League Festival in 2017. You can watch the video of the event further down the page or click on UEFA Champions League – Cardiff 2017. This prestigious footballing event is held at different destinations annually, and is the culmination of a tournament pitting Europe’s elite football clubs against each other. The finalists in 2017 were Real Madrid & Juventus, and UEFA were keen for as many fans as possible to have their image captured with the legendary trophy – the famous Champions League Trophy. 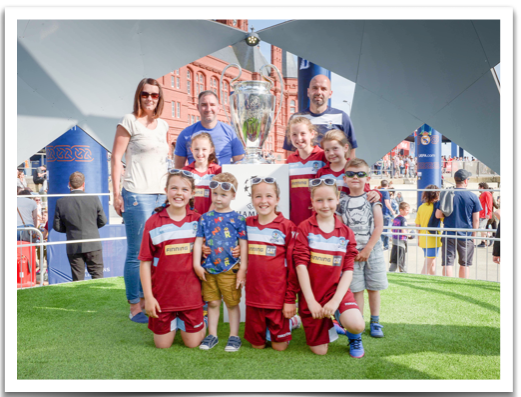 Equally the images (digital soft copies) were provided as a gift from UEFA to the fans: dramatically improving the whole UEFA experience; making the event more memorable; and ensuring fantastic publicity for the UEFA brand, as fans could download and share their images instantly. 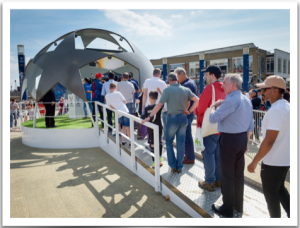 Image Insight has a well-established and successful relationship with UEFA, having previously worked with them at both the 2016 and 2015 finals, as well as providing a unique experience on the UEFA Euro 2016 Train last year. We are also extremely proud to announce that UEFA have already asked us to provide their photographic solution in Kiev, 2018. UEFA recognises that Image Insight provide their guests and fans with a high quality automated photographic solution and, as such, we are able to assist a large volume of visitors quickly and efficiently, ensuring that the whole guest experience is one of continual enhancement of UEFA’s brand. They know that they can truly depend on Image Insight due to our excellence in customer service, attention to detail, and proven methods. The experience for the guest is slick and intuitive. Following the capture of their image alongside the trophy, the guest is issued with a printed receipt, which contains a secure digital photo code. Then, after being directed to the specific UEFA branded micro-website, the guest is able to access a wonderful digital soft copy of their photos, which they can almost instantly share to social media, email to friends, and download to their own devices. This proposition is a well-proven delivery solution, catering specifically for high visitor numbers in sectors such as, Cruise Ships, Football Stadiums and other large sporting events, and is facilitated by our unique and highly efficient VEGA software system. We enable almost instant upload of the guests’ photographs to the micro-website for immediate access but in addition, provide excellent data capture management information, which is tailored to our client’s needs. UEFA find this perfect for marketing and customer relationship purposes. 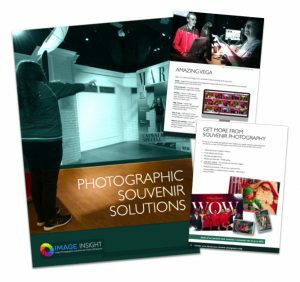 The ethos of Image Insight is one of exceeding clients’ expectations. We do this by listening to our customers and providing excellent service. Our proposition includes full technical and operational support, commencing with an initial consultation. Our technical experts bring their experience, knowledge and design capability to the forefront by working on the best solution for the client, thereby providing absolute confidence and satisfaction before, and throughout the live event. We provide a wonderful experience and a memorable photographic souvenir, and Image Insight is extremely proud to be working with UEFA, one of the world’s most iconic footballing brands.